Carly Rae Jepsen Covers Billboard Magazine. 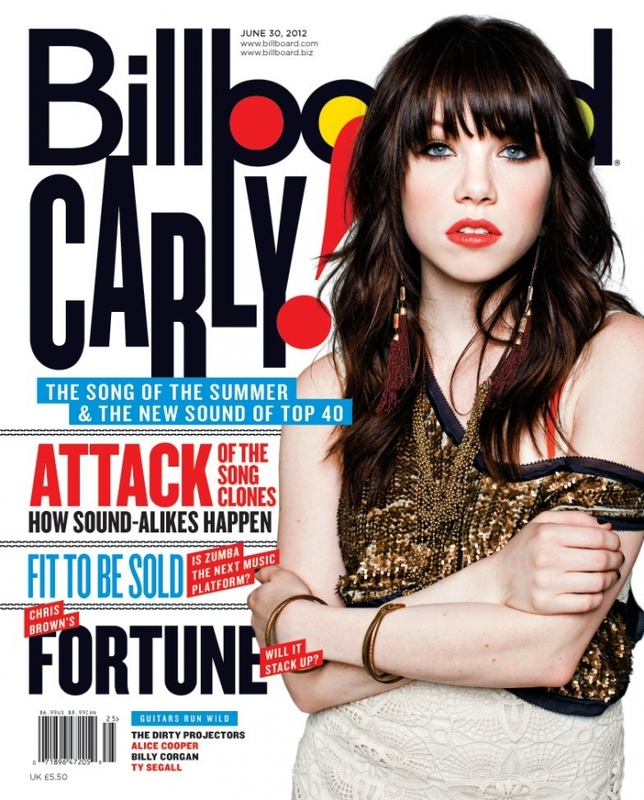 Carly Rae Jepsen covers the latest issue of Billboard magazine. The 26-year-old Canadian singer, who seems to be on everyone's lips this year, talks to the magazine about her rapid rise to the top, Justin Bieber's influence, Call Me Maybe, her next album and writing with LMFAO. 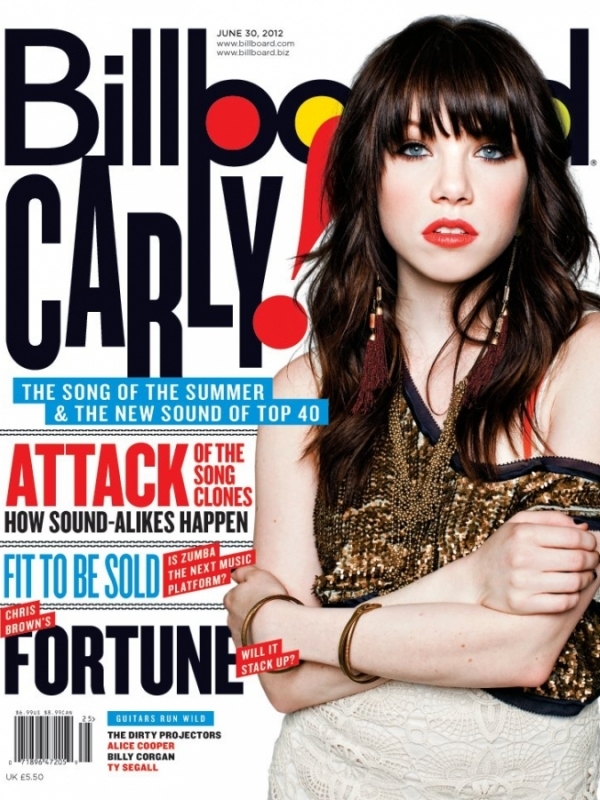 Carly Rae Jepsen covers the latest issue of Billboard magazine. The 26-year-old singer, who seems to be on everyone's lips this year, talks to the magazine about becoming an overnight sensation. "Pretty much every day, there's a moment where I'm having to pinch myself and think, 'When did this happen to my life?'" she says. Still, Jepsen, who in 2007 placed third in the fifth season of Canadian Idol, admits that, "What I really love about music is that, despite all this craziness, the creative process remains the same. And that same exciting feeling that I had before anybody knew me, when I was just beginning to work on 'Call Me Maybe,' is the same feeling I had today with RedFoo from LMFAO. You can sense the people who really have it are about writing that right word or that right melody to make it lift and make you feel that perfect emotion." Jepsen's single 'Call Me Maybe' was met with much success, reaching the top of both Billboard and Canadian Hot 100. Katy Perry covered the song, the Harvard baseball team danced to it, and Colin Powell sang it on "CBS This Morning." Moreover, its official music video has collected over 121 million views on YouTube and spends a second week atop the Mainstream Top 40 chart, with 126 million in all-format audience. WHTZ (Z100) New York PD Sharon Dastur says that, "If you look at our playlist, there's a ton of people on here you hadn't heard of six months ago. We're in that perfect pocket of music where it's just all different styles, and that's what people are looking for at the moment. It's not that they're sick of [veteran] artists - this music is just so unique and fresh." Justin Bieber's manager Scooter Braun first listened to the song last January. "I said, 'This is the best pop song I've heard in like 10 years,' so I went on a rampage to track it down," he recalls. On Justin Bieber, Carly says that, "Yeah, he's a lovable guy and his music is amazing. I'm especially into his new record ["Believe"], which just came out. I know my sister is dying, because she's also kind of a mega-fan. It was very out-of-the-blue to get some attention from him." Jepsen never imagined herself rising to the top with 'Call Me Maybe.' "I mean, it's hard to tell. There's always a special feeling I have while writing any song. I know with this particular one, it happened the way a lot of songs happen, with just Tavish [Crowe] and me on the road together, with an acoustic guitar. I would sing out ideas and he would play off some chords. Actually, the chorus lyrics came out really easily - the entire thing: [singing] 'Hey I just met you, and this is crazy.' We thought it was a nice little pre-chorus or something," she recalls. "We brought the idea to Josh and he was like, 'That's your chorus right there, keep that, that's it.' After a little while of production and just working together we had the song done. It was really easy to write," Carly says. Speaking about 'Call Me Maybe', Jonathan Simkin, co-founder of Vancouver-based 604 Records, also says that, "It wasn't even slated to be her first single. That was me having to fight for that one - the Universal radio team, that wasn't their first choice. It wasn't anybody's first choice, except me. I just knew there was something about that song." Read Carly Rae Jepsen's full interview in the latest issue of Billboard magazine.